Wolves runner Hayden Hollowell had a great meet last weekend, stringing together 3 personal best performances in three days at the 2014 Caltaf Classic in Calgary. On Friday, Hollowell took 16 seconds of his best 3000m Steeplechase time, recording a mark of 10:02, good for 4th place overall. Saturday saw another PR, this time in the 1500m when he stopped the clock at 4:07, the 8th best time in the event. 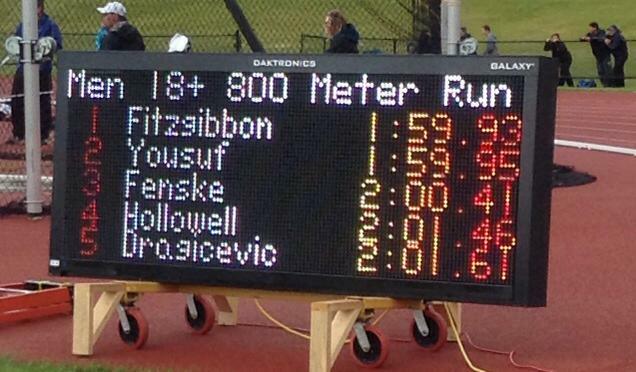 Hollowell competed in the 800m on Sunday and again ended up with a life time best time of 2:01, good for 14th place. This entry was posted in Outdoor Track and Field, Uncategorized and tagged Athletics Alberta, CALTAF Classic, Hayden Hollowell, Wolves Athletics Club. Bookmark the permalink.